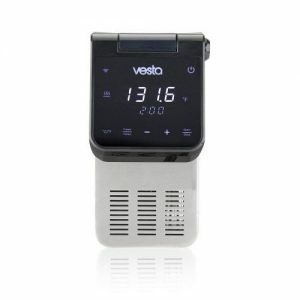 The Vesta Imersa Elite Sous Vide (SV81) is a high quality Commercial Grade precision cooker. It was the most affordable of all of the Commercial Grade Sous Vide models we reviewed and was the only one to have Bluetooth Connectivity allowing it to be controlled from your smart phone. $189 Current Price - YOU SAVE $46.06. This is a very high quality model, you can feel it's a lot more durable than your standard consumer model, but this quality makes it two to three times the price of consumer models. This model has a rectangular shape and is a lot wider than the tube design you find on most sous vide models. It's just over 4" wide, so it may not fit in smaller curved cookware. The control module is designed to mount over the front of the pot, which puts the cord in an awkward location. This model is 7.9" in height it has a standard strength housing and a stainless steel housing for the heating unit. It has an adjustable clamp that allows you adjust the position both horizontally and vertically, this is the most flexible configuration you can have. This model puts out 1200 watts of power, which is higher than the average for the models we reviewed. It has a flow rate of 1.2 GPM, which is higher than 2.0 GPM average for the models we reviewed. This high power and high flow rate on this model means you will have to be much more vigilant about the water level on extended time cooking projects. The high power and flow rate of this model means it will reach your set temperature a lot more quickly than most models. We don't have any real complaints about this model other than the price. It's probably more powerful and durable than most people will ever need. If you are going to use it frequently or do a lot of extended cooking projects this may be a good choice for you, but for most people the Anova Bluetooth Sous Vide is a much better value. 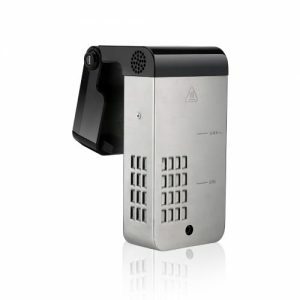 7.9" x 4.4" x 4.1" 12.5" x 5.5" x 3" 14.2" x 3.9" x 7.4"
The Vesta Imersa Elite Sous Vide is a high quality commercial grade sous vide with Bluetooth Connectivity. The Wancle Sous Vide is a great way for you to start sous vide cooking at a budget friendly price.